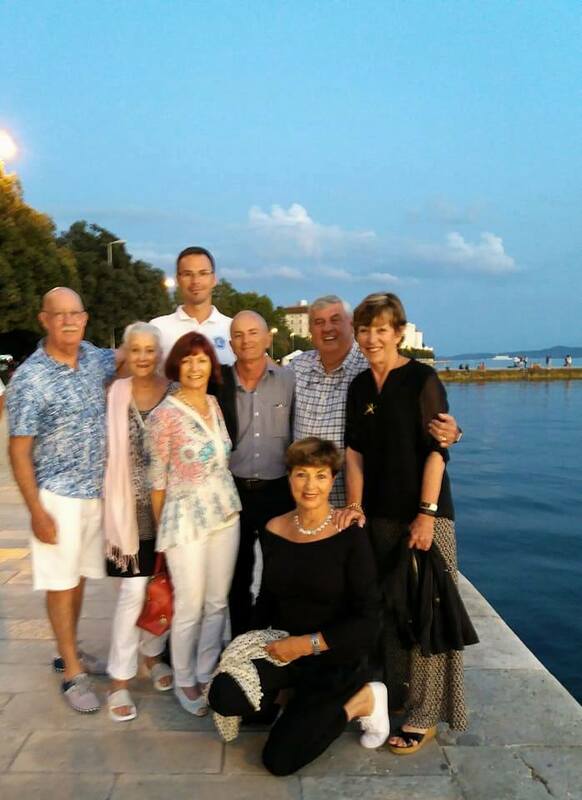 Sailing Split to Zadar was a new experience for my group from Australia. Returning after two years, following their first cruise Dubrovnik to Split in 2015, their expectations were somewhat muted..not sure of what to expect this time but glad to be back all the same. 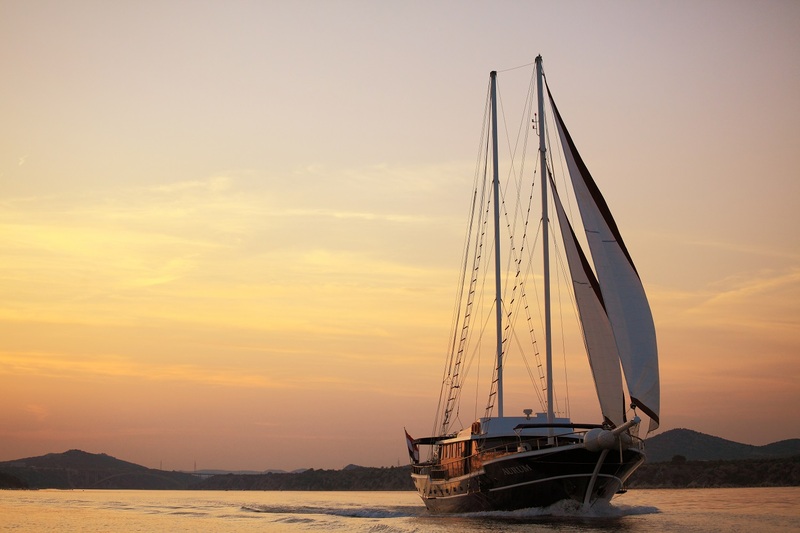 Sailing on the same luxurious gulet AURUM, embarkation was scheduled for 17.00 in Trogir in early September. 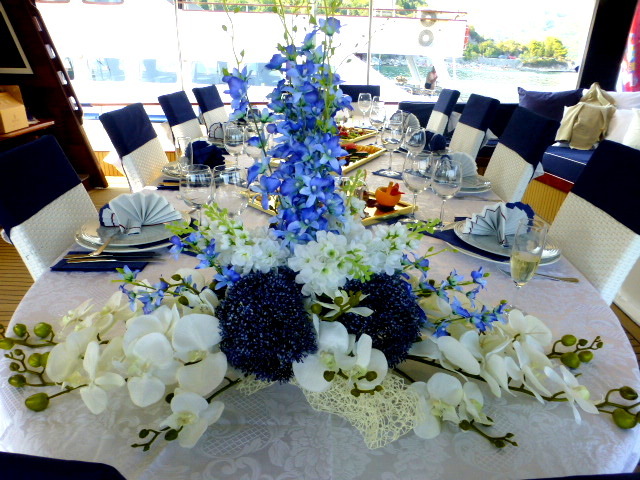 Captain Jere Gačina and crew were waiting, well prepared and happy to see the return of their guests. The feeling was mutual. 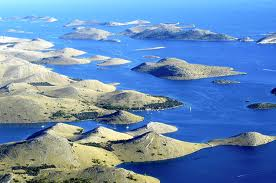 Saturday 02/09 TROGIR –Embarkation 17.00 Welcome drinks – sail to Maslinica on Island Šolta. This small village with the most breathtaking sunset is located on the west side of Šolta. Archipelago of seven small islands (Polebrnjak, Saskinja, Stipanska, Kamik, Balkun, Šarac and Grmej) is just one of many things that make Maslinica one of the most beautiful places on the Adriatic coast. Restoration of the castle into a hotel and the construction of a nautical marina are turning this village little by little into the tourist centre of the island that greets more and more guests each year. Apart from Maslinica, the boaters find the neighbouring bay, Šešula, with its safe anchorage and unique gastronomical experience very attractive. 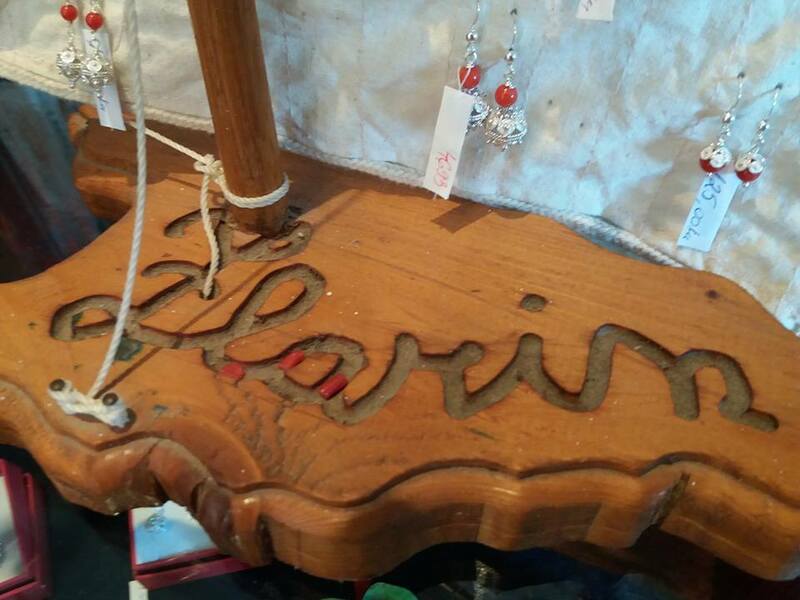 Sunday 03/09 Island Šolta to Island Zlarin The Island of Zlarin is renowned for handmade red coral jewellery. 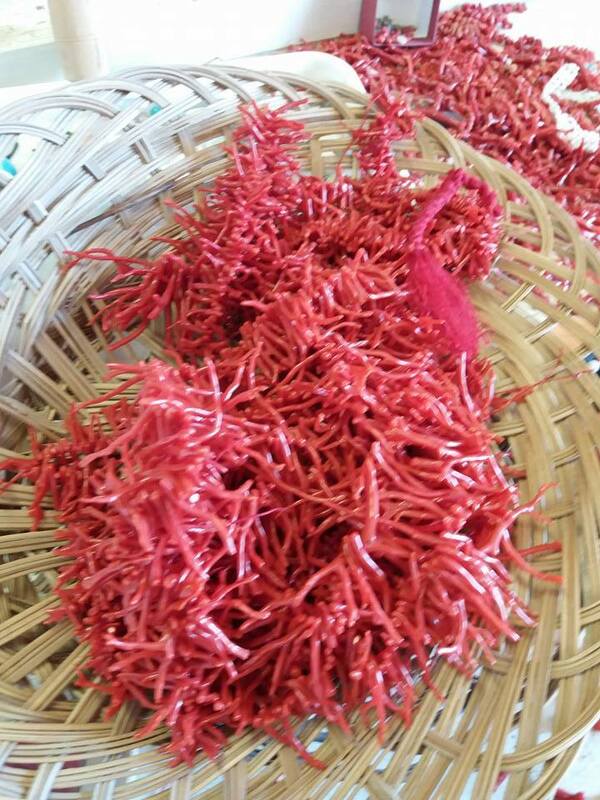 Take a visit to the coral centre where you can see the process of jewel making and buy some quality souvenirs. 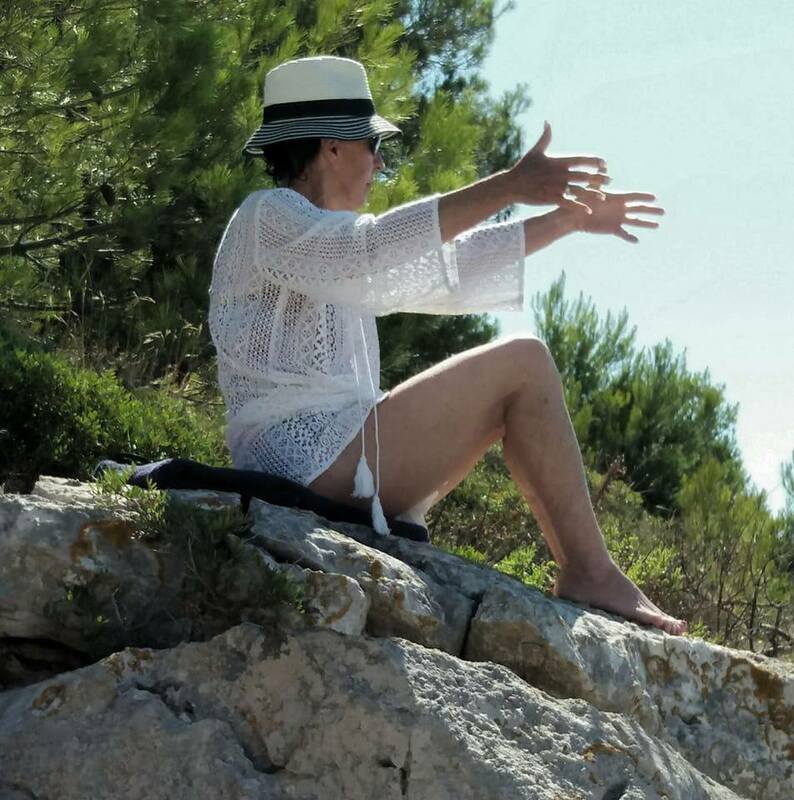 Zlarin was a resort for the nobility of Šibenik and one of the most beautiful villas on the sland belonged to Ester Mazzoleni , a famous soprano at the beginning of the 20th Century. Today, the owner of the mansion located at Vela Oštrica cape, is Anthony Maglica, the inventor of Maglite Flashlight, who is of Zlarin origin. Monday 04/09 Is. Zlarin to National Park Krka, moor in Šibenik late afternoon The Blue-green oasis in Šibenik’s karst hinterland is a ‘must see’ sight! The main attraction of the Krka River are it’s waterfalls, created by calcareous sinter. 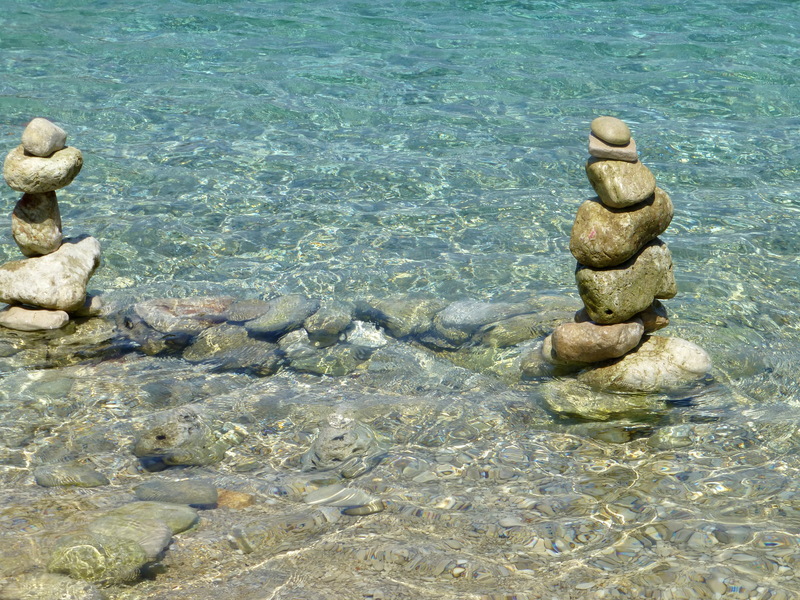 The area where the Krka River flows is covered in limestone which is slowly evaporating due to various chemical and physical processes in the atmosphere and under the surface. This splendid natural creation is home to a Franciscan monastery on the Islet of Visovac; an Orthodox Krka Monastery, medieval forts, old mills and the first hydropower station in Croatia. 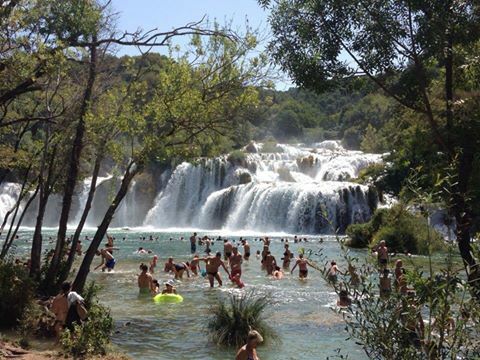 There are seven Krka waterfalls, the last one Skradinski Buk is the most beautiful. The small charming town of Skradin is on the River Krka, and often you will find Bill Gates strolling down the quaint cobbled streets. There are many excellent restaurants in Skradin,and also in Šibenik. A Gourmet Traveller’s delight ..dining at PELLEGRINI RESTAURANT in Šibenik.. voted Number One restaurant in Croatia 2015/ 2016/2017..and we can understand why!! 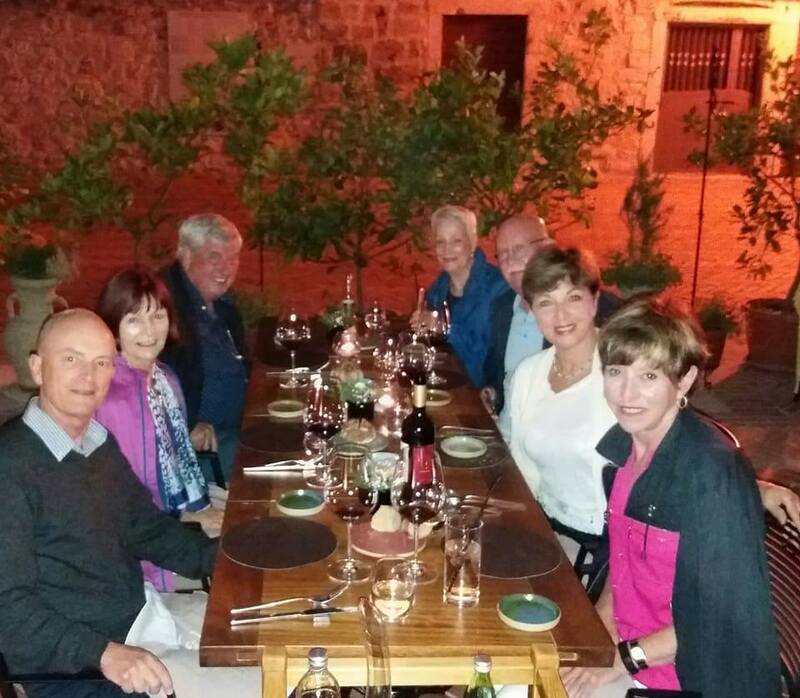 We all agreed it was superb..every mouthful so delicious, the ambiance, the service and choice of wines by our waiter..all over seen by owner/Chef Rudi Stefano. Tuesday 05/09 Sibenik to NP Kornati Islands …Moor on Is. Ravni ZakanThe Kornati archipelago is comprised of 89 islands, islets, and rocks which makes it one oft he most indented archipelagos in the Mediterranean. George Bernard Shaw, fascinated by the beauty of the Kornati Islands wrote: ‘ On the last day of Creation,God put the finishing touch to His work and created Kornati Islands with tears , stars, and breath!’ In 1980 a large part was set aside as a National Park due to it’s scenic landscape, interesting geomorphological features, rich marine life and indented coastline. 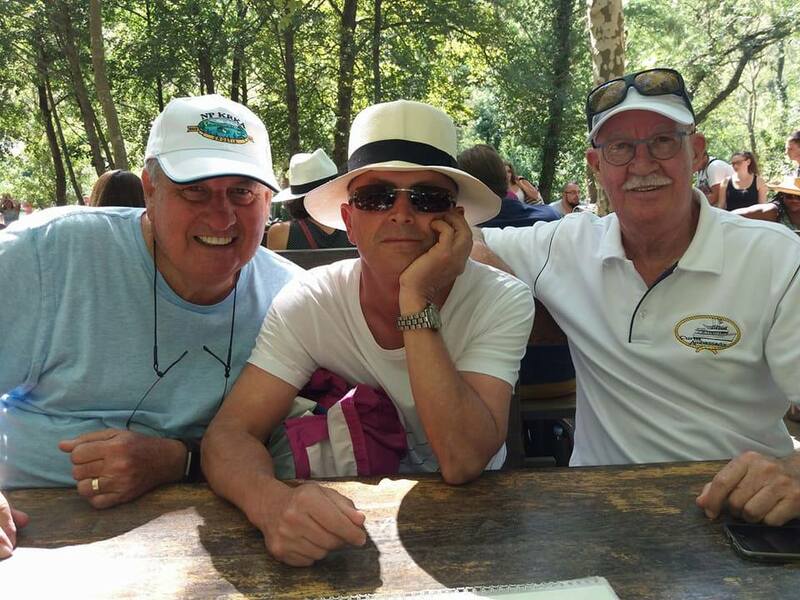 The clarity of the waters of the Kornati is amazing…..
A great photo of the boys, Mick, Grahame and Peter..at Krka Falls..
Thursday 07/09 Island Dugi Otok The largest and most indented island, boasting undiscovered natural beauty. Saharun inlet has a white sandy beach located on the northern side oft he island, and interesting village of Sali, the main town of the island, a typical Adriatic village. 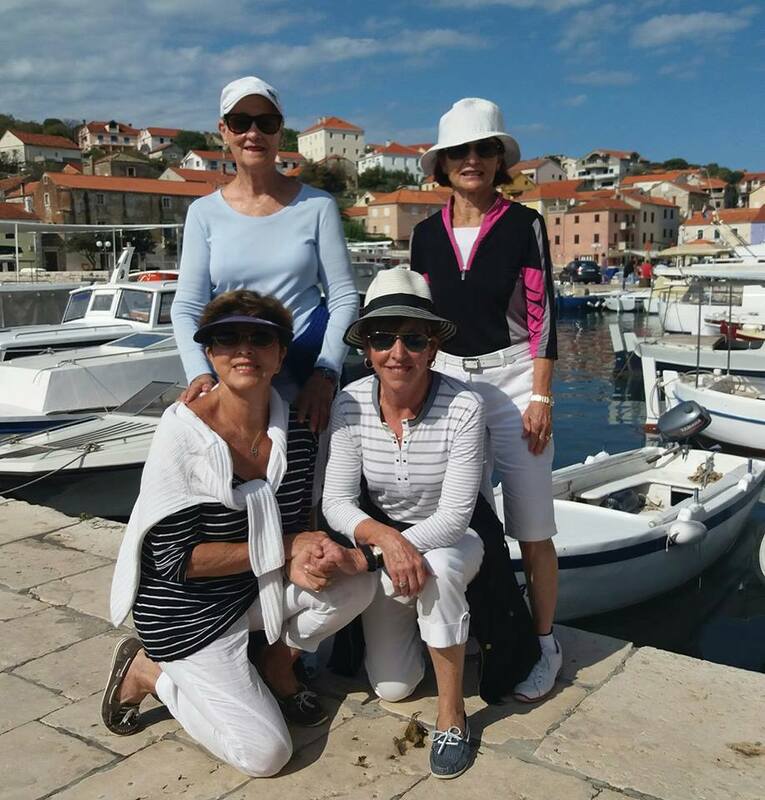 We sailed into the small village of Sali on Dugi Otok…here we found a very unpretentious and charming little harbour with classical music wafting across the water.. It was coming from the cutest little ecclectic library ..a place that proved to be a favourite place to relax in a comfy chair , pick up a book, enjoy the music, and the photography..on the walls..on the ceiling, a very welcoming place to many visitors who entered and were pleasantly surprised. 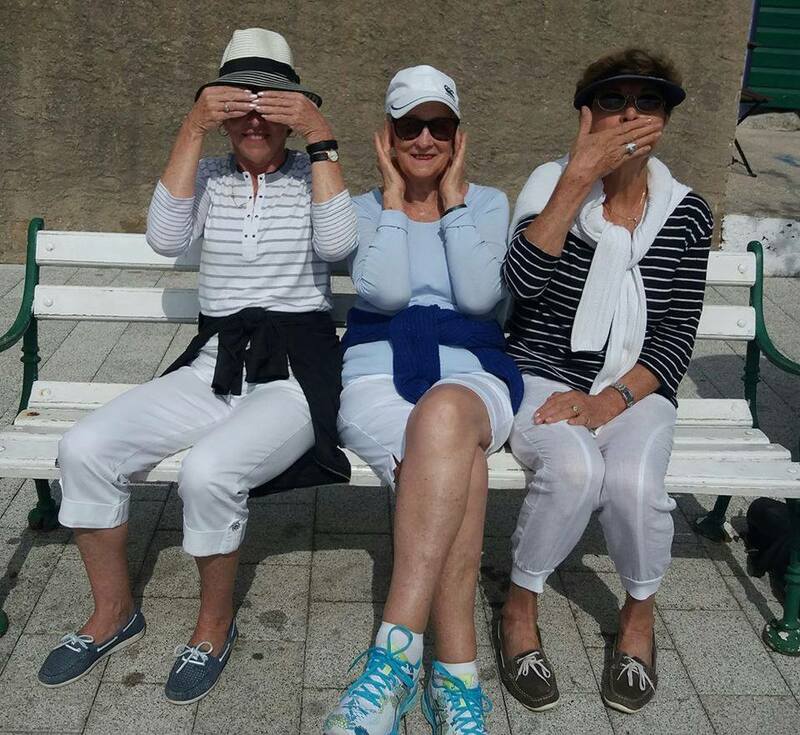 The girls in Sali harbour..See no evil, Hear no evil, Speak no evil ! One of the most beautiful sights is the 7-9th Century church of St. Pelegrin Savar on the South East part of Dugi Otok. 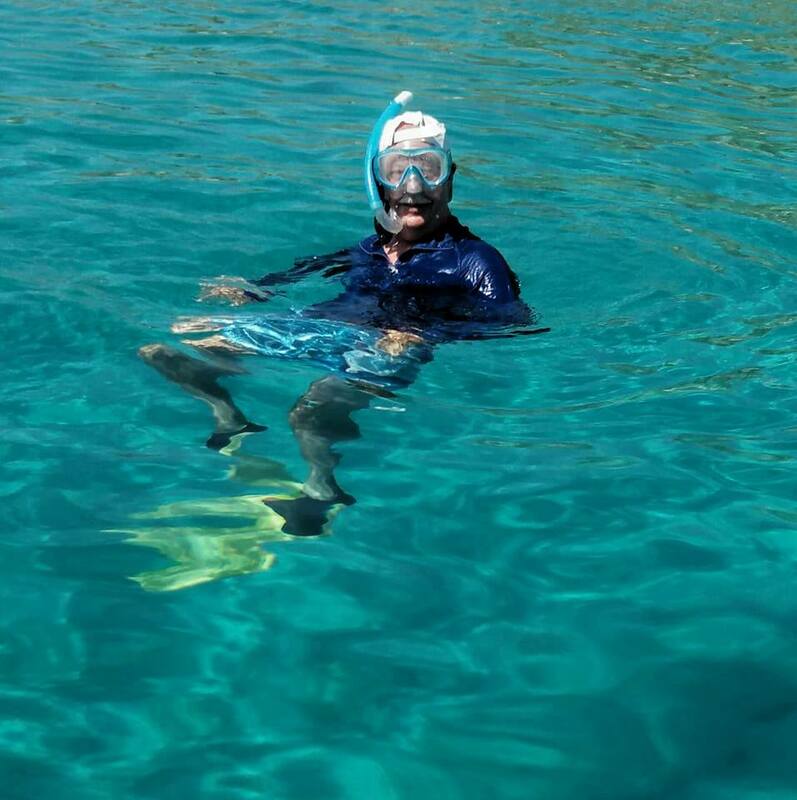 That’s Peter snorkeling on the Island of Levemaka. 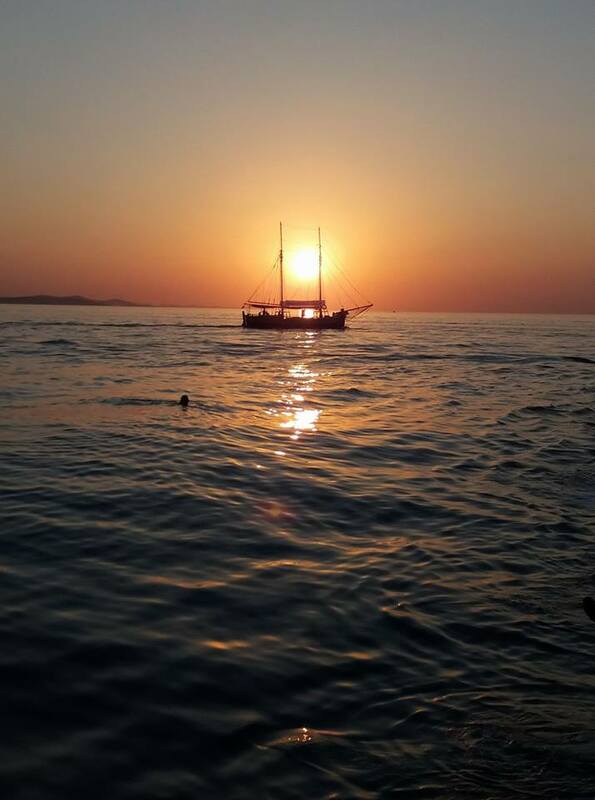 Friday 08/09 Zadar – Swimming in the bay close to Zadar..evening in the Old Town. The Zadar region is located on the Northernmost part of Dalmatia. It takes pride in it’s rich cultural heritage and numerours natural sights such as National Park Paklenica and nature parks Velebit, lake Vransko, and Telašćica. Zadar Old town has been populated for 3000 years . First a small settlement of the Illiyrian trib, followed by the Roman Era, and in the 7th Century it became the centre of the Byzantine province of Dalmatia. 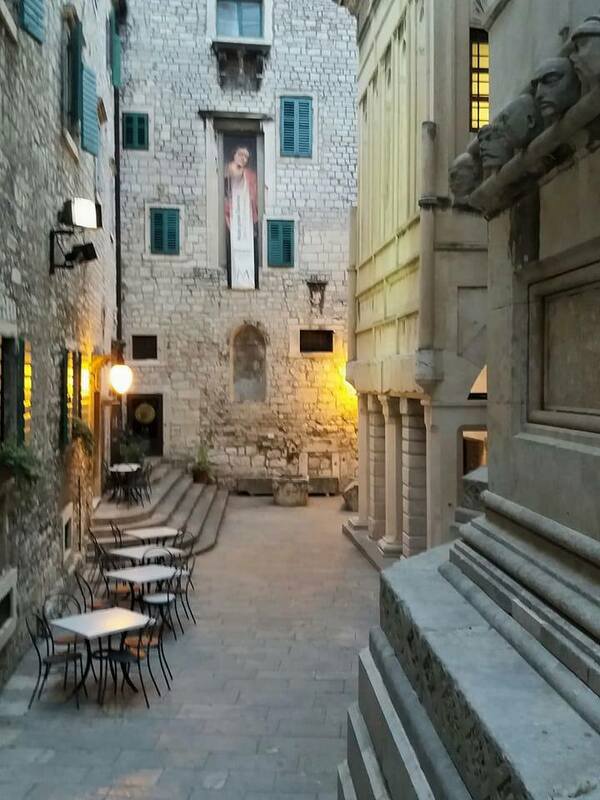 The Roman network in the streets and squares have been preserved in Zadar and remnants of roman urbanisation are still visible in the city. 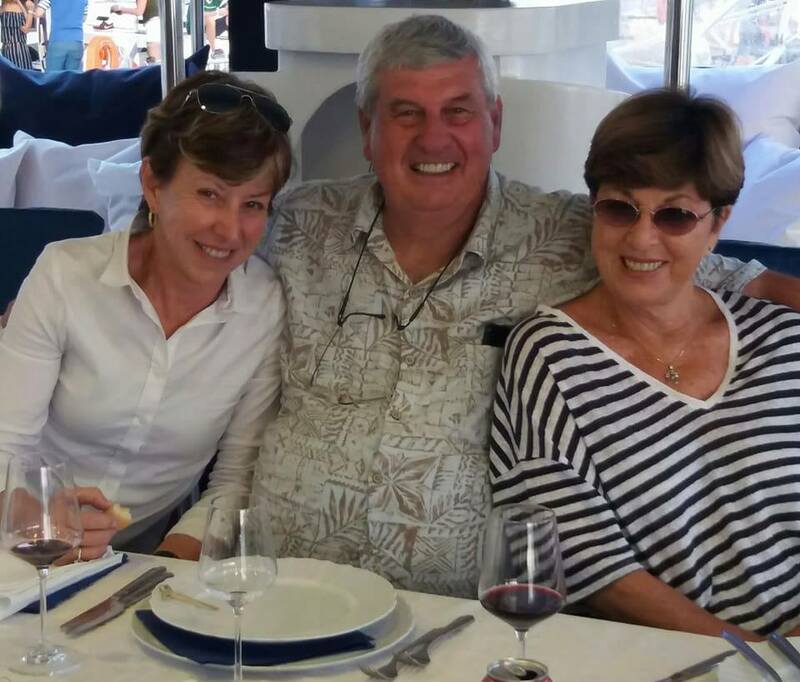 Denise Mick and myself..on Board MY AURUM. Sunset in Zadar..walking the esplanade in Zadar..on our way to dinner in the Old Town. The city of Zadar has much to offer. Voted the BEST DESTINATION TO VISIT in 2016. Here we visited the Ancient Glass Museum and watched objects d’Art being blown, and were in awe of the exhibition of ancient glass jugs, bowls, vases 2000 -3000 years old. 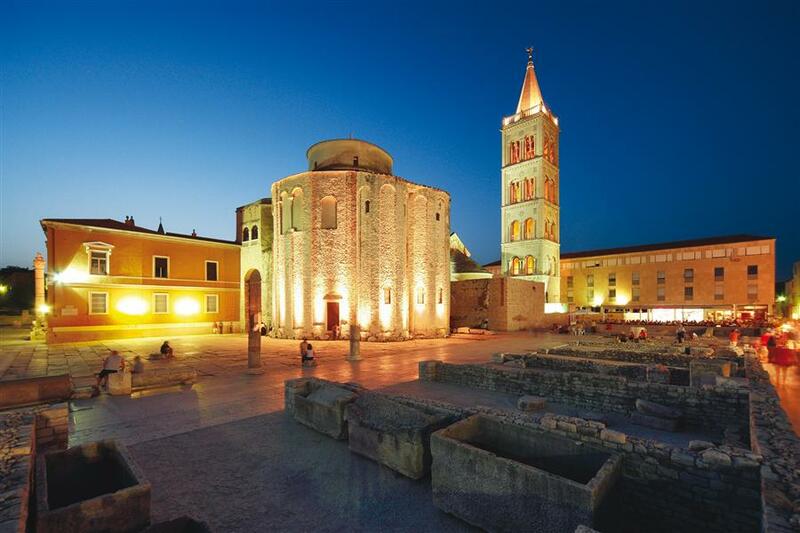 St.Donat 9th century Cathedral is the heart and soul of Zadar, which is so simple yet so overwhelming spiritually. Impressive ecclesiastical art is at the permanent exhibition of Gold and Silver at the Church of ST. Mary of Zadar, one of the most valuable collections in Croatia. The end of our 7 day cruise has ended. We thank our crew for a wonderful cruise through these waters and islands of natural beauty..a sailing paradise! We will disembark on Saturday morning and spend 2 nights in Zadar before continuing a 10 day tour of Istria in the north, ending with 2 nights in Zagreb…Discovering Croatia by land and sea.